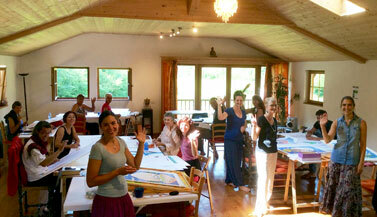 Creating a large painting for the Dalai Lama! 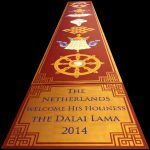 We are very happy that His Holiness the Dalai Lama recently visited The Netherlands again. 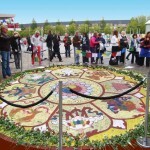 And just as for his previous visits to her home country, Carmen Mensink was asked again to welcome him in a special way by creating a large (9 meter / 30 feet) special painting of the Eight Auspicious Symbols. In January, February and March 2019, Carmen will be living and working in -according to her- the most beautiful city on earth, and will have some time to offer individual thangka drawing and painting courses in Venice, Italy. 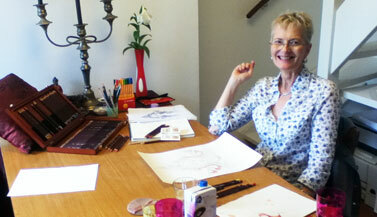 Carmen Mensink offers workshops, retreats, lectures and guided tours on Buddhist Art at many places around the world. Here you can check if she comes to a place near you. 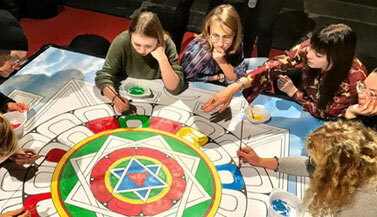 For the recent Museum Night Amsterdam, Carmen created a project where the visitors helped to paint a large (2x2m) Tibetan Mandala, the Mandala of the 5 Elements. 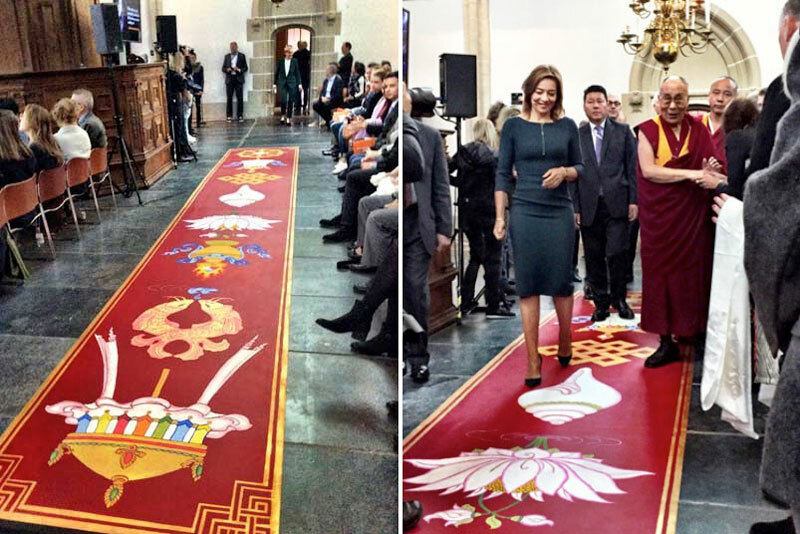 She was asked for this by the Nieuwe Kerk (on Dam Square in Amsterdam) because of the special exhibition on the life of Buddha that is currently running. Carmen’s mandala is still on view until the end of the exhibit. 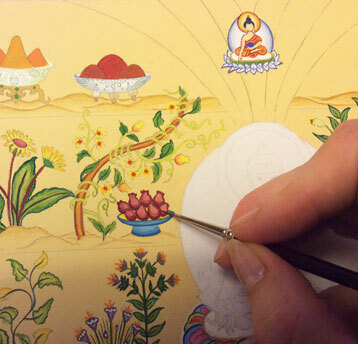 Thangka Painting Summer Retreats 2019! 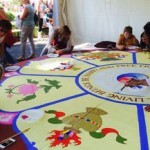 Check out the pictures of the Italy Thangka Painting Retreat 2018, where people from all over the world came together to enjoy the drawing & painting classes, as well as the meditation sessions, lectures on Buddhist art, the beautiful area, special premises and the amazing (organically grown) Italian food, and the friendships that were made. Until Feb 3, 2019 a special exhibition will be on show in Amsterdam, that was opened by HH. the Dalai Lama on Sept. 16, 2018. It also includes a personal thangka of the Dalai Lama, showing different scenes of Buddha’s life. 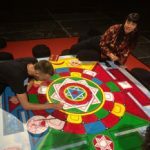 During the recent Museum Night Amsterdam, Carmen lead a project where the visitors helped paint a large Tibetan Mandala, the Mandala of the 5 Elements, it’s still on view! 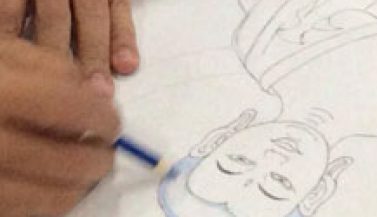 Sri Lanka Thangka Art Course feb. 2020! The second special Thangka Art retreat & Sightseeing tour in Sri Lanka will be held again in February 2020! You can already be placed on the list if you want to be sure of your space. If you sign up for the Newsletter, we will keep you updated. To read all about the first art trip to Sri Lanka (early 2017) go to Buddhist Art Retreat 2017 with Ven. Banthe and Carmen Mensink. 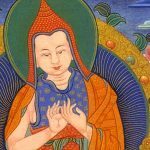 This site shows Carmen Mensink’s Thangka Paintings and the Thangka Drawing & Painting Courses that she offers in many different countries – most of them are also suitable for people with no drawing or painting skills whatsoever. 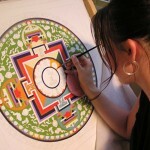 Carmen can also be commissioned to paint a thangka of your choice, or to let her gild & paint your Buddha statues, according to the Tibetan Buddhist tradition. In the Thangka Shop you can find presents for yourself and others. 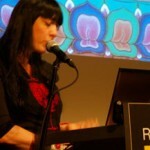 Carmen explains her passion for Thangka Painting in this short video (in Dutch) made by Happinez Magazine. Check also the article about Carmen and her artwork in Happinez Magazine. Mandala of the Buddha of Compassion. Click on the image for info. In Tibet, the painting of thangkas was an important and highly developed means of expression through which the entire Buddhist philosophy could be explained. And it still has this function: thangkas are used in temples & monasteries and are hung above the altars to support the Buddhist meditation and practice. The Chinese invasion in Tibet in the 1950’s and the destruction of a lot of old Tibetan traditions and monasteries makes it even more important to keep this beautiful tradition alive and pure. 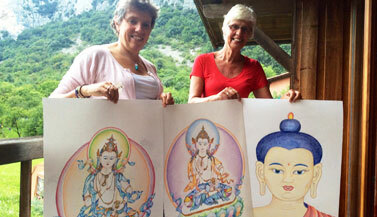 Carmen Mensink offers workshops in Tibetan Buddhist Art in Europe, United States and Asia. 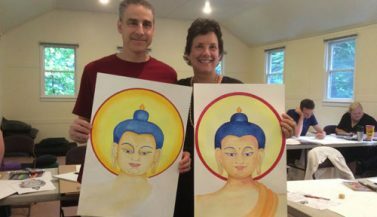 Most courses are for both beginners and advanced, and all courses come with a guided meditation, slide shows and talks on the symbolism of the subject (a Tibetan Buddha, Mandala or Symbol), and a lot of individual guidance. 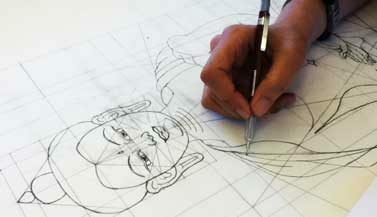 Carmen offers day classes and weekend courses in Buddha drawing, as well as in-depth thangka painting retreats that last a week or longer. 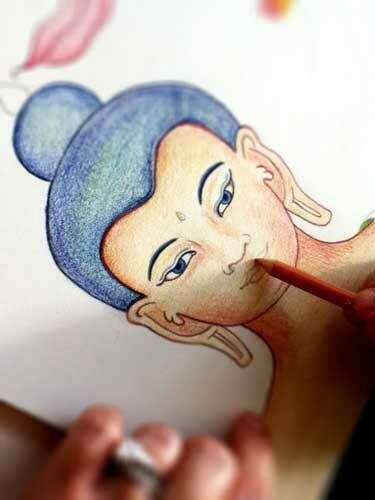 She also offers individual teachings on thangka drawing and painting, for those who rather work one on one with a teacher instead of being in a group. There’s a lot of guidance and a lot of time to answer your questions. 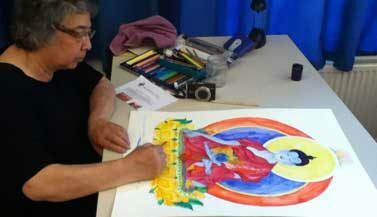 Carmen passes on the Art of Tibetan Thangka to her students with a lot of joy and dedication. She inspires them to reach their full potential in art and at the same time inspires them to go inside, meditate and check their mind and work on its potential, according to the Buddhist philosophy – which is inseparable from Buddhist Art. It doesn’t matter if people have drawing and painting experience or not, most important is the joy they experience during the courses and what’s going on inside themselves – which undoubtedly will be expressed in their artwork. What else can I find on this website? 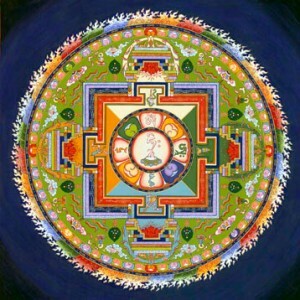 A Tibetan Buddhist Mandala is a diagram of geometric patterns. Each Buddha has his own mandala, which can be seen as the universe or palace in which the particular deity resides. 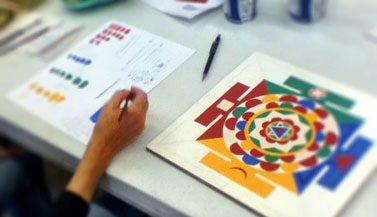 Each part of a Tibetan mandala has deep symbolism behind it, which you will learn during the mandala drawing and painting classes with Carmen Mensink. 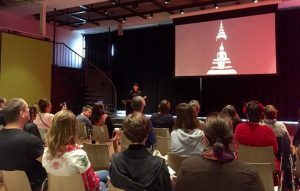 During her classes, Carmen always gives one or more slide shows and talks on the subject, for example a Buddha and his mantra, to explain the meaning and symbolism behind it. She is also regularly asked to give lectures on different subjects in Tibetan Buddhist Art, at museums, universities and Buddhist centers, and writes articles on Buddhist Art, which are added to the Media & Publications page. The face of a Buddha statue is traditionally painted with pigments and gold. 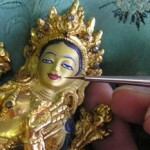 Carmen can paint your Buddha Statue according to tradition, with pure gold and the right colors. On this website you will also find more explanation on the Buddhist Philosophy -as this is inseparable from Buddhist Art. Just search for the words you are looking for in the search bar. ... Om Mani Padme Hum! Want to read this website in a different language via Google translate? Click here to go to the top right corner and select your language.